^ Check this out, if you haven’t already! This is the second post in this little halloween series of little makeup looks. I’m trying to keep them pretty easy to start with and will hopefully build up to some things which are little trickier. I’m not entirely sure what this is… ? I think it’s pretty cool though and because it’s not anything in particular it means that you could easily match it with whatever outfit you wanted. As I said, this is a pretty easy makeup look to do. Don’t mistake easy for quick though, this will still take you a while. I started this by applying my foundation on the parts of my face that would look normal. Pretty self explanatory, right?! Then you just want to go ahead and trace a line using some black face paint, or eyeliner or whatever you have to mark out the creepy parts of your face. 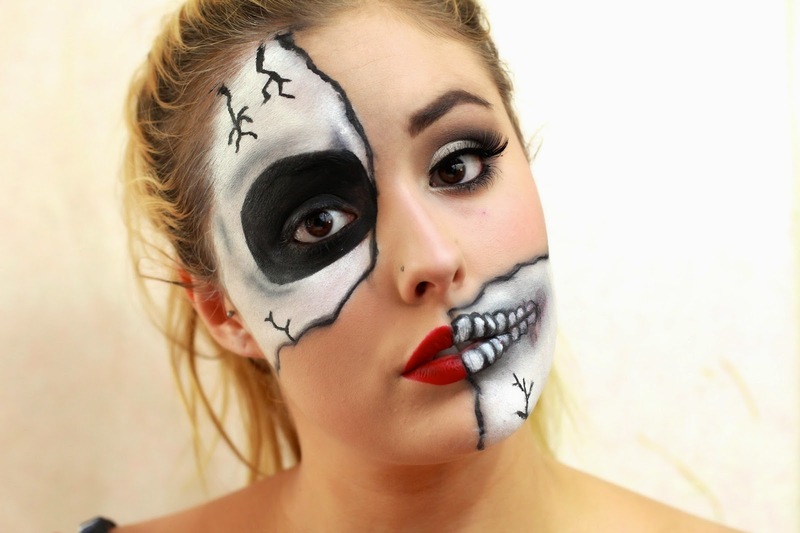 You can smudge this out so it doesn’t look as sharp but you may want to leave this until you’ve used a white face paint to fill in those parts. I’d recommend using a sponge and dabbing it on rather than making it look seamless, you want this part to look pretty scabby and gross. For the skeleton type teeth, you want to fill the whole area in white and blank your lips out and then simply draw the teeth out. On the normal eye, I used some HUGE lashes from Kiss and did a bit of a smoked out look. I used Ruby Woo from MAC on the normal half of my lips and bam, you’re pretty much done.